Homicide detective Luc Claudel believes the bones are historic. Not his case, not his concern. But when Tempe examines the bones in her lab, she establishes approximate age with Carbon 14. Further study of tooth enamel tells her where the women were born. If she's right, Claudel has three recent murders on his hands. Definitely his case. Detective Andrew Ryan is acting mysteriously. What are those private phone calls he takes in the other room, and why does he suddenly disappear just when Tempe is beginning to hope he might be a permanent part of her life? Looks like more lonely nights for Tempe and Birdie, her cat. As Tempe searches for answers in both her personal and professional lives, she finds herself drawn deep into a web of evil from which there may be no escape. Women have disappeared, never to return...Tempe may be next. This book didn't grip me and I wasn't compelled to keep listening. I did finish the book eventually. 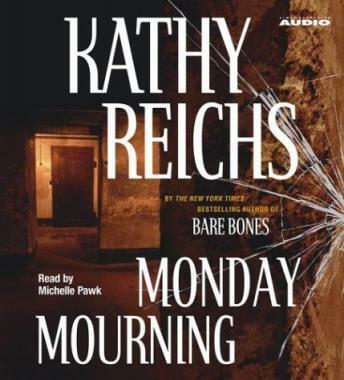 This was my first book by Kathy Reichs. I had seen a few episode of the TV series. Must say the book is better. Michele Pawk did a good job reading and pronouncing the French words. Look forward to more stories. Enjoy the fact the story takes place in Canada. This was an interesting book, but I couldn't rate it over a 3. It was interesting, but it definitely didn't excite me. This book is like here others, both in the writing and the reader. I personally enjoy them, and the details of how she goes about her job as the story unfolds. I'm not the biggest who dun'it fan, but I guess the details of the science speaks to the Engineer in me.